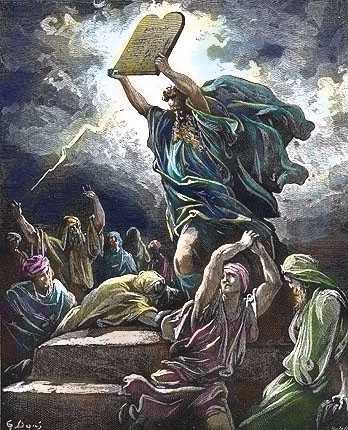 What Do We Make of the God of the Old Testament? There is no escaping the fact that the Old Testament contains many troubling stories of violence, genocide, and even one famous story of God asking a patriarch to kill his only son. My aim is not to solve these problems. Such a goal is beyond my scope. My intent is far more modest. I simply want to suggest a few things that are often forgotten or not properly understood when it comes to reading the Old Testament. The first has to do with God, the second with culture and context, and the third has to do with how we understand the Scripture itself. The beauty of the God of the Scriptures is that He comes to where we are. The Biblical narrative moves rather quickly from creation– the original and beautiful design– to Fall: the fracturing of relationships between God and humans, humans and each other, and humans and their world. This fracturing has resulted in a separation from God and a severely impaired (or “totally depraved”, depending on your theology) ability to know God. But it is often forgotten that when Adam and Eve sinned, God isn’t the one hiding. Humans hide; God comes calling. And in saying that God comes to us, we must acknowledge that God is the one who condescends. He lowers Himself, comes into our world, speaks to us in our language. We will say more about this later, but this is the reason why we cannot take something God said in the Old Testament as the final word on a subject. Often, the Old Testament is the first word, the place God begins in His dealing with us. Take, for example, the famous (or infamous!) call for Abraham to sacrifice his only son, Isaac. As moderns, we find this request–even if it were a test— to be simply appalling. What kind of God would ask a man to kill his son? As it turns out, the answer is, not YHWH. We are on solid footing to suggest that God spoke to Abraham in the only language the he, a pagan, could understand. Asking for a man to kill his only son was, in the ancient pagan world, the ultimate way to express devotion to a god (see: Molech). So, YHWH met Abraham where he was, asking for his devotion in a language that Abraham understood. BUT…the stunning part of the Abraham and Isaac story isn’t that God asked him to kill Isaac, but that God would not let him do it! YHWH shows Himself to be not the god who asks for child sacrifice, but the God who provides the sacrifice! In this way, YHWH was slowly revealing Himself to be different from the gods of the ancient world. He had to start where they were, and then reshape their image of God. In aknowledging that God meets us where we are, we have also admitted that that world is different from ours. But more needs to be said about the world of the Old Testament. When we read stories of divinely commanded genocide, we cannot fathom how a good God would command that. If one holds to a more conservative view of Scripture, things are trickier to resolve. But there are still things that ought to be considered. What if the nations that Israel was instructed to conquer were so wicked that the only way to give humans a chance of surviving was to eliminate entire sections of early civilizations? Could there be an evil that could not be stopped unless the people whom that evil inhabited were stopped? This was the logic of many of the decisions in the world wars of the 20th centuries. On a lesser scale, Bonhoeffer and others came to the conclusion that though murder was wrong, allowing Hitler to do what he intended to do was worse. Still, the horror of the after-effects of Hiroshima and Nagasaki, show that such a logic or an ethic has its limits. Though this is a far lesser scale and a much lighter note, an example of parents may be helpful. On a long road trip, a parent may instruct their children to not speak or touch each other. If this command were taken as an absolute–a command to be obeyed in all situations– the parent would be viewed with horror. How could you tell your children not to talk to each other? Why wouldn’t you want them to hug each other and love each other? What kind of parent does that? But if the children were yelling and screaming at each other, hitting and hurting each other, then the instruction to be quiet and keep their hands to themselves is not only necessary to keep order but also a mercy: it prevents the children from doing a kind of damage they may find it hard to recover from. 3. The Old Testament Is Not the Last Word on God. The Bible is not a cook book of recipes and formulas for life. It isn’t a coffee table book full of inspirational quotes and sayings. It is a Story. And one cannot jump into a story and make conclusions about the characters or the moral of the story. In one way, the message of the Old Testament is similar to that of Tolkien’s “Lord of the Rings”: The world is chaotic and rife with evil. It is crying out for a King. But no king was found that is worthy– not an Egyptian Pharaoh, not a Babylonian king, and not even an Israelite king. In this way, the stage is set for the Messiah– Jesus!– to arrive as the world’s true Lord and long-awaited King. So good man…so good! Very eye opening post, and a challenging post for many I am sure…love it! Keep it up Glenn! Personally, I don’t think the best way to describe this vs. that is a liberal vs. conservative view of Scripture. I think it’s more a matter of what gets the center, or the foundation. In one view (or should I say orientation of faith itself? ), it is Scripture that gets the foundation. In many ways, this is reflective a what I think could be highly associated with a uniquely modern, foundationalistic epistemology. In a different view, it is that Christ gets the center and that Scripture is then characterized within that context as a broad, overarching narrative that’s role is to point to Him. Rather than being a matter about being liberal vs. conservative (which sadly on the street and in the pew gets projected beyond the theological and mapped into the sociopolitical) why not instead shape the conversation around this question? – What (or Who?) is the center of our faith? Or alternatively, how do we know God? To call Bible-centrism “conservative,” is significantly to focus principally on the history of the modern era and significantly not the patristic or apostolic. I wonder if this kind of conversation could be framed better. I’d personally suggest that being “conservative” conserves the essence of the faith. And as Christians, we understand that Jesus of Nazareth *is* the Essence of God. At least it’s my personal understanding that the orthodox faith is one where it is Christ that is “homooúsios” with God the Father, not the Bible. To me (and I may be quite wrong), *that* seems quite “conservative,” at least from a historically Christian perspective with quite traditional understandings of the doctrine of the Trinity and Christology. Again though, I could be quite wrong about all of this. Excellent discussion: appreciate both Glenn’s final reference to the fact that “The true nature of God comes to clear focus finally and fully in Jesus.” I also deeply appreciate Gary’s careful response to say it is “the orthodox faith is one where it is Christ that is “homooúsios” with God the Father, not the Bible.” Jesus is perfect theology and the way to know God. I could be wrong though Dr. Wood. Of the sermons that I’ve heard over the years, most haven’t explicitly or implicitly had the orientation I describe here. I’m possibly quite rogue. Thanks for this post, Glenn. I’m currently studying Genesis and this is very relevant. Quite related to this topic and specifically related to Genesis, yesterday Evangelical theologian Peter Enns took on an interesting one about Adam. Enns contrasts the inerrantist model of Scripture with an incarnational model (which personally I find at least somewhat more descriptive than affixing of conservative vs. liberal labels). Enns tries to frame a few big questions ahead for Evangelicalism and its methods of Biblical interpretation. http://www.patheos.com/blogs/peterenns/2013/04/framing-the-evangelical-discussion-of-adam-and-evolution/ To me, it seems there are a number of dimensions here, at least more than I am personally capable of neatly systematizing. Great stuff, Glenn. A couple months ago I read “The Blue Parakeet” by Dr. Scot McKnight, and, while it’s emphasis is a bit different, he focuses not only on seeking culturally relevant interpretations of Scripture (he takes quite a bit of time on the subject of women in ministry) but also the “story” aspect. And while the book felt a big fragmented to me, the idea of the Bible being a narrative was very freeing, as I had been struggling with aspects of the OT, seeming inconsistencies, etc… Thanks for adding to this great perspective.